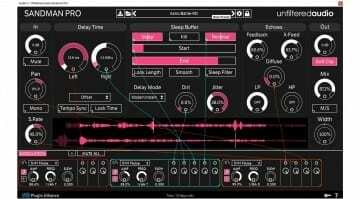 Unfiltered Audio is a great provider of knobby, slider-y sound design plug-ins for mangling audio in 10 different directions. 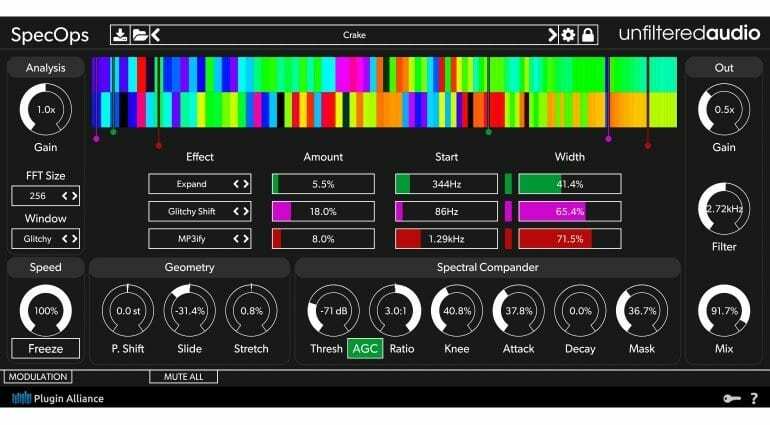 It has announced a swiss-knife of an audio destructor called SpecOps – a blend of no less than 36 different spectral effects for total glitchy mayhem. SpecOps’ locus of power is an analysis engine with the heart of a granular synth. It slices audio into tiny chunks spread over frequency bands, and you are left to apply up to three spectral effects to each of the bands. Multi-band effects extravaganza ensues. Effects are a big selling point of SpecOps, and as we reported, there’s plenty of them. The 36 processors include specialties like assorted filters, envelopes, pitch and frequency shifters, audio freezing, data compression (talk nerdy to me! ), glitching, and clipping. There’s also the Spectral Commander, which handles dynamics independеntly for the separate effects via some exotic compression. In addition, you can effect the input signal before it hits the special effects array with wideband processors – pitch shifters, frequency shifting, and Freeze effect. Obviously, there’s a lot to take in with SpecOps, which won’t surprise anybody who’s familiar with Unfiltered Audio’s output. Adding to the varied effects section, a patchable modulation system gives you up to six modulators to toy with. If the 16-step sequencer, input follower, sample & hold, or macro control ever feel too esoteric, you can always fall back on the four LFOs and get those knobs and parameters going on their own. All of the intensity going on with SpecOps is visualised in many pretty colors. This plug-in probably rocks on LSD, and definitely sounds the part, too. Unfiltered Audio is selling SpecOps for an introductory price of 89 USD until October, down from the 129 USD regular price. The plug-in is available in VST, AU, and AAX formats for Windows and Mac computers. More information can be found at UA’s website.